Congratulations, it is our pleasure to award your website with our Silver award. You have a well designed site that meets the criteria for the award level given. We appreciate your interest in our program and look forward to visiting your site in the future! Best wishes for continued success with your internet endeavors. Award manager SAS Michelle Blaine. Congratulations! Your site definitely qualifies for the Silver Sinapsis Award for an Intellectual Attitude. 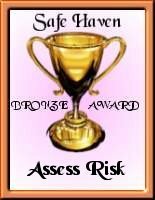 Please find enclosed your personalized award. I really enjoyed the opportunity of reviewing your site. You may provide a link back if you wish too, (It is NOT a requirement). Thanks, and congratulations again, Alberto.